Born in Pontiac, March 9, 1936. Ordained June 3, 1962. Parochial Vicar, St. Joseph, Rock Island, 1962; St. John Chapel, Champaign, 1969. Pastor, St. Thomas, Peoria Heights, 1981. Vicar, Peoria N.W. Vicariate, 1986. Chaplain to His Holiness, 2003. 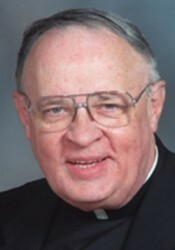 Vicar, Peoria NW Vicariate, 2004. While remaining Pastor, St. Thomas, Peoria Heights, to Administrator, St. Vincent de Paul, Peoria, 2004. Pastor, St. Thomas, Peoria Heights, 2005. President, Peoria Notre Dame High School, Peoria, 2007. Prelate of Honor, 2007. July 8, 2015 to Senior Status.